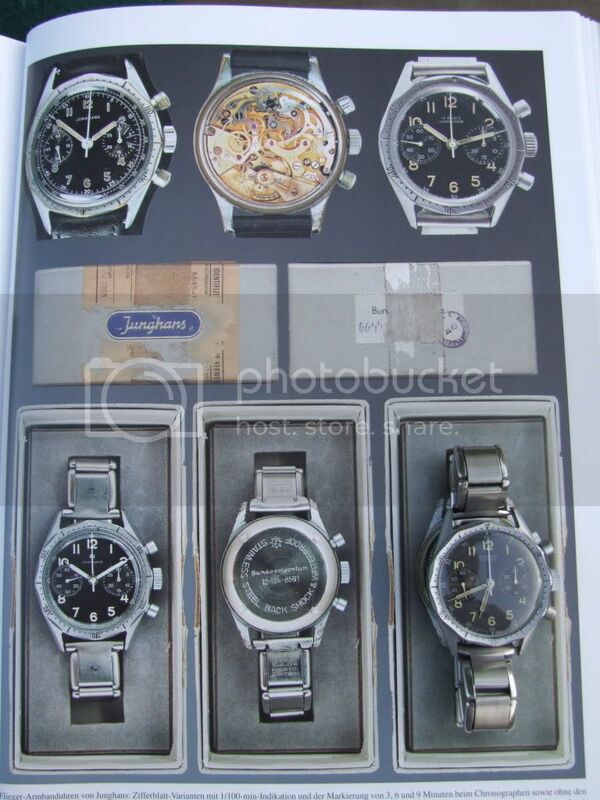 Been looking through old threads here and on MWR but can't find any explanation of the different dial and bezel variations of the Junghans BUNDs. Please look at the attached picture. I previously was (wrongly?) assuming that the "19 RUBIS" is the original and the "Made in Germany" a later replacement, but this hasn't been mentioned in any thread I could find. Does anyone have info about this topic? Bezels: when looking at this picture it looks like the triangle at "12" is slightly wider on the "19 RUBIS", can this be confirmed? additionally another "strait" version of the sub-dial hands have been seen, which isn't shown in the pic below. Last edited by ATG; 04-03-2010 at 20:18. Longbear, looking at the photos I've just realised that there are four, not three, dial variations. The photos below were taken on Konrad's book. First, there are two different "19 RUBIS" variations, one has "JUNGHANS" above and "19 RUBIS" below, like mine and the other is vice versa. 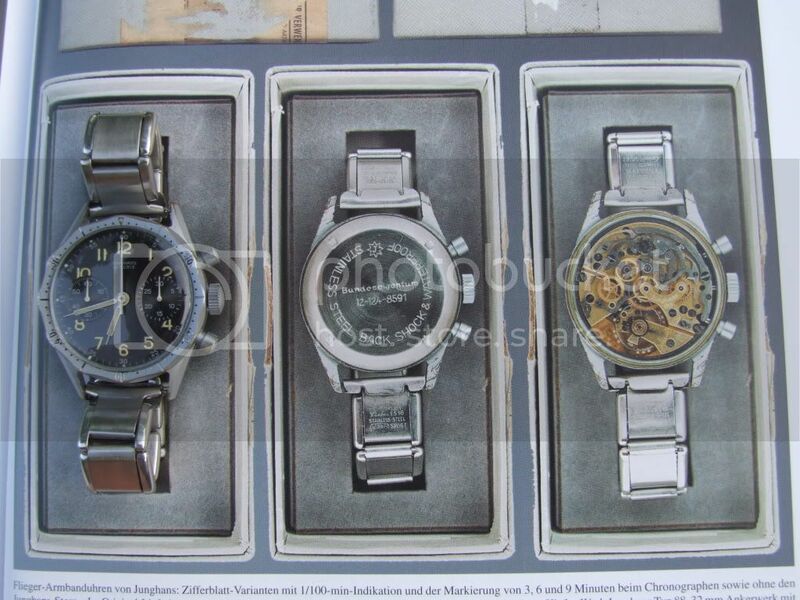 I had heard that the earlier watches had a short NSN, (excluding the rather obvious "6645" indicating that the item is a watch), whereas the later examples had the full number. However, the best way of determining age used to be to contact Junghans - there was a very pleasant old boy there who could help if you gave him the movement number. I have his contact details somewhere if you want them but he might have retired by now. The early examples (like mine from '59) had gilded movements - I don't know about the later ones. Judging by the lume, again I would assume that the "19 RUBIS" versions were earlier. I have always thought that these interesting watches with their beautiful gold-plated fly-back movements with Breguet spring, screw balance and shock proofing, not to mention their Lockheed Starfighter heritage, are greatly underrated. Last edited by StampeSV4; 04-03-2010 at 22:26. Thank you so much Jon and Al - I need to buy Knirims books very soon. I have never seen the 1/100 minute configuration before. Also funny that the 19 RUBIS exists in two versions. The one featured in Zero Hour is actually opposite of yours, but no one seemed to notice when they were discussed on MWR. Pleased we could help. That's the second time this has happened in the last few months. Nalu and I posted recently elsewhere about our MN Beuchat 1000m divers and during that thread we realised that there was another variation which even Deskdivers.com had missed - as a result the website has been revised. I guess sometimes when things are familiar it's easy to overlook the obvious?